In 1961, President John F. Kennedy announced an ambitious goal of sending an American safely to the Moon before the end of the decade. 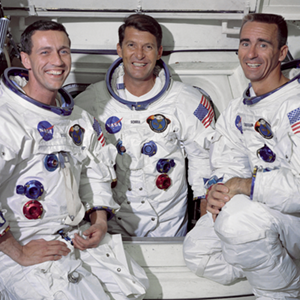 First, NASA learned to live and work in space with the Mercury and Gemini missions. Ultimately, NASA answered the challenge in 1969 with the successful landing of the Apollo 11 Lunar Module (LM). To record their historic voyages and collect scientific observations many thousands of photographs were acquired with handheld and automated cameras during all the Apollo missions. After returning to Earth, the film was developed and stored at Johnson Space Center (JSC), where they still reside. Due to the historical significance of the original flight films, typically only duplicate (2nd or 3rd generation) film products are currently available for study and used to make prints. Metric and Panoramic Frame scanning and processing has been completed! The full collection consists of 10,153 Metric frames and 4,697 Pan frames. There are also handheld images available from the Mercury, Gemini, and earlier Apollo missions in the Browse Gallery!